Migaloo the whale continues to tease Australians with brief, unsuspecting appearances. The all white humpback whale was spotted off Caves Beach near Newcastle in New South Wales, Australia on July 26 at 5:15 p.m. local time, according to its official Twitter page. 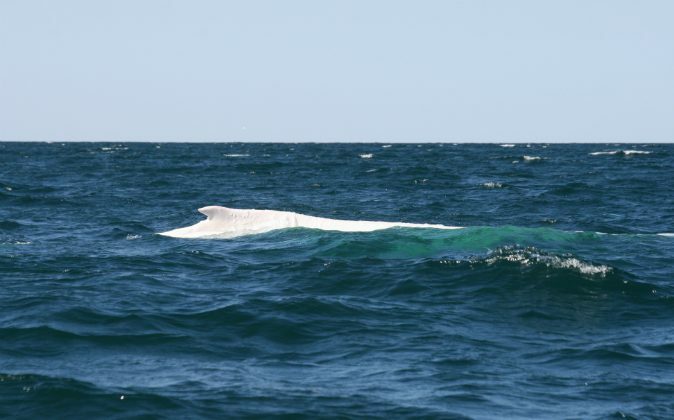 This is the second spotting of Migaloo in just 24 hours. On July 25, Alison Reid recorded a video of Migaloo off Ocean Shores during the morning. Migaloo’s first sighting in 2016 was on July 21 at 9 a.m. at Port Stephens. He was traveling north with a female friend. The photo was taken by Ronny from ORCCA. Up until 2011, Migaloo was known to be the only whale in the world to sport an all-white humpback until a new white whale unofficially named MJ (Migaloo Junior) was born. The distinct look of an all white humpback has made Migaloo the whale and its Jr. an attraction among Australians who anxiously vie for a view of the mammals. Migaloo is protected under Australian law.